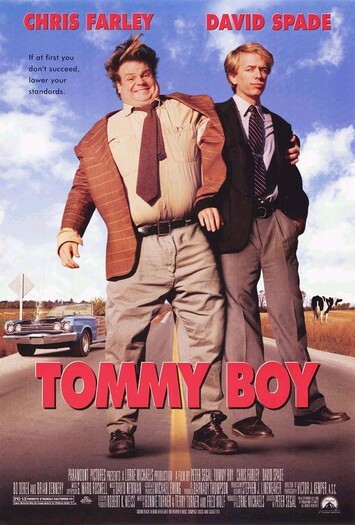 Tommy Boy. Paramount Pictures 1995. I know this is a big cult favorite, but I was never very into Chris Farley. Maybe if he’d lived longer, he’d have done something that specifically interested me, but the main thing I think of for him is the “I live in a van down by the river” guy, which is not a character I find funny. On the other hand, his costar is David Spade, whom I do like, and don’t see enough of. While I think I had my fill of Just Shoot Me, some slightly less abrasive Spade is a lot of fun. I’m not really sure that gets the idea a cross, since “abrasive” is what he does, but he was just too much there. Tommy Callahan finally returns home to the family business after graduating with a seven-year bachelor’s degree. Callahan Auto Parts has been family owned for generations, but business has taken a downward turn lately, and the bank loan they already had to take out is coming due. With Tommy’s father Big Tom at the helm, the one thing they can do is move parts, but he dies immediately after remarrying. In order to raise the money they need to save the company from defaulting and getting sold to Zalinsky Auto Parts, Tommy takes his father’s assistant Richard with him on the regular sales trip. But something is rotten in Callahan’s. The beginning and end seem divorced from the middle. For most of the movie, everybody back home that we got introduced to earlier is either spinning their wheels or setting up the climax. The story is an excuse for all the fun stuff that happens on the road with Tommy and Richard, and doesn’t do a good job of hiding it, but also doesn’t just admit it. Just before they return home, all their hard work is negated, leaving them with only the character growth needed to save the day anyway, and the remains of a classic car. Most of the humor is pretty funny (though I could do without some of the fat jokes) and that’s almost entirely from Farley and Spade’s character performances. Hardly anybody else really leaves any impression, though Rob Lowe’s (mysteriously uncredited) performance as a scheming karma magnet is fun when they indulge in it. However, it’s a bit of a problem when I completely don’t care about the love interest. As an adaptation of Hamlet, this isn’t the most transparent one I’ve seen. It helps that the lead characters are directly part of the plot and not just pre-existing characters brought into a coup at a business named Elsinore. Also the focus of the plot is shifted. The point of this movie is the traveling, not what’s going on back at the castle. The machinations back home are, again, only enabling Tommy and Richard to be thrown together. I certainly wouldn’t have known it was based on it if I hadn’t been told. Watch this movie: for some fun with mismatched traveling companions. Don’t watch this movie: for 90 minutes of “Fat guy in a little coat”.